Bad Company recorded four classic albums in as many years, giving rise to some of the most recognizable rock songs of the Seventies, including Rock Steady, Run With The Pack and the Grammy-nominated, “Feel Like Makin’ Love.” After releasing remastered and expanded versions of their first two albums in 2015, the band will return this spring with deluxe editions of their next two albums from that incredible run. 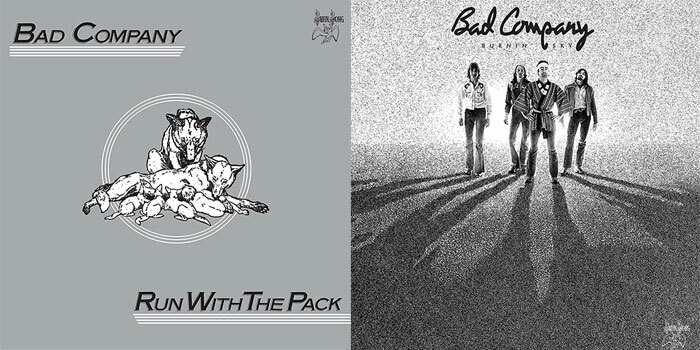 Run With The Pack (1976) and Burnin’ Sky (1977) have been newly remastered from the original production tapes. Each has been expanded with rare and unreleased recordings taken from the original album sessions. The CD versions of these Deluxe Editions include all of the new bonus tracks, while their 180-gram vinyl counterparts offer a selection of the bonus material. The Deluxe Editions of Run With The Pack and Burnin’ Sky will be available on May 26th on 2 CD and 2 LP. The music will also be released digitally and available through various streaming outlets. During a rare break from touring, Paul Rodgers, Mick Ralphs, Simon Kirke and Boz Burrell got together in France to record new songs using the Rolling Stones’ mobile recording studio. Those sessions produced Run With The Pack, a ten song album that came out in early 1976 and rose to #4 in England and #5 in America, where it sold three million copies alone. Radio stations embraced the title track along with a cover of The Coasters’ “Young Blood,” while “Silver, Blue & Gold” became one of the band’s signature tracks, even though it was never officially released as a single. The bonus disc that accompanies Run With The Pack: Deluxe Edition includes unreleased early mixes for “Honey Child” and “Simple Man,” as well as an extended version of the title track. There’s also the previously unreleased “Let There Be Love,” an outtake from the recording sessions. In fact, the acoustic version of “Do Right By Your Woman,” previously only available as the B-Side of the single release of “Run With The Pack,” is the only song on the bonus disc that has ever been previously released. During the summer of 1976, the band returned to France yet again to record 12 songs for what would become Burnin’ Sky. They chose Château d’Hérouville as the studio, which is where David Bowie would record Low later that same year. Burnin’ Sky was released in March 1977, and broke into the Top 20 in both the U.K. and U.S. The Burnin’ Sky: Deluxe Edition bonus disc features unreleased versions of nearly every song on the album, including alternative takes and mixes of “Man Needs A Woman” and “Morning Sun,” plus the full version of “Too Bad.” The session tapes also unearthed “Unfinished Story,” a song that was completed, but never released.